This plant was previously known as Rhus crenata. Searsia crenata is a member of the Anacardiaceae, the mango family. 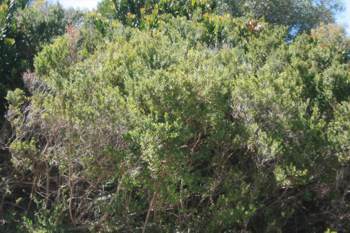 This evergreen shrub or small tree can reach a height of 3-5m; trees are without spines. 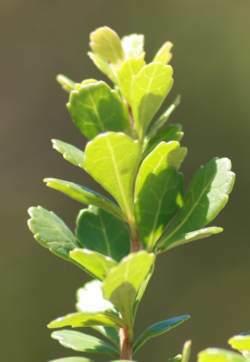 The leaves are alternately arranged and are trifoliolate (each leaf has three leaflets). The petiole (leafstalk) is very short and the leaflets are sessile (attached to stalk). Leaflets are 10-20mm long, leathery, narrowly obovate to rounded and bluntly pointed at the apex. Leaflets are dark green above and lighter in colour below; they appear to be hairless. 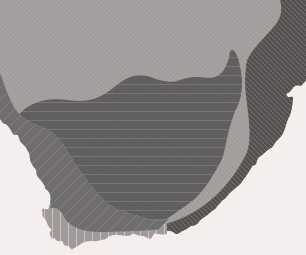 The top third of the leaflet margin is scalloped. The flowers are insignificant, white to almost cream and appear in small clusters at the tip of branchlets during autumn to April. 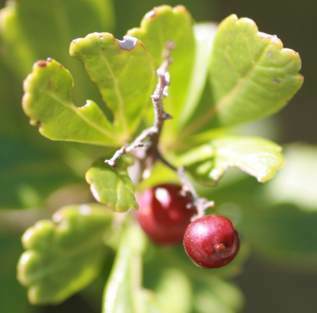 The fruits are small round red-brown to pale black berries. Searsia is a mainly a tropical to subtropical genus of about 250 species of which 62 species occur in South Africa. Searsia crenata occurs from the Cape Peninsula to Umzumbe in southern KwaZulu-Natal where it grows in dense colonies on the coastal and inland dunes. The species name, crenata refers to the leaves that are toothed with crenatures or scallops. Fruits are popular with birds. The plant produces a heavy fruit crop which ensures successful germination and subsequently species survival. A large number of butterflies breed on various Searsia species. This plant grows well on sandy dune soils and is a good sand binder, therefore a useful plant for coastal gardens. It can be pruned to make an effective and attractive hedge. It serves as an ideal windbreaker and can be successfully used as a subject for bonsai. Searsia crenata is very hardy and grows well in mild to warm areas. It can be grown in pots provided that the pots drain well. The height and shape of plants can be controlled by pruning. A trailing plant with similar water requirements can be planted at the feet of the plant for some variety. Searsia crenata can also be grown as a small tree, but the plants reach their full potential when planted in groups to form dense hedges to control wind-swirl areas in your garden. They grow very well in sandy soils. Propagation from cuttings is relatively easy. Cuttings should be made two months before the flowering season, between December and February. Cutting material works best at the length of 70mm and all new growth at the tip of the cutting should be removed. Remove one third at the base of the cutting and dip it in a fungicide solution. Allow the cutting ends to dry and then dip it in a rooting hormone agent; hormone powder works well, but ensure that you shake off any excess powder. Use the following mix for your cuttings: 50% milled pine bark with 50% coarse river sand. You also have the option to use polystyrene or perlite in the place of river sand. Cuttings perform best if they are placed on a heating bench with an automated irrigation system and enough air movement in the greenhouse. Cuttings should develop roots within three to five weeks, after which they can be removed from the greenhouse to a hardening-off section, where an organic fertilizer can be applied to cuttings. Once cuttings reach a height of at least 100mm, pot them up in a mixture of 50% compost and 50% coarse river sand with a slow-release fertilizer, or a mixture of 60% fine milled bark and 40% coarse river sand (E. Hull pers. comm.). Aphids can be successfully controlled by spraying with an organic pesticide. Fruits are often parasitised, but because large numbers of fruit are produced, the chances that a large percentage will survive to ensure successive generations is good. Germishuizen,G., Meyer, N.L., Steenkamp, Y. & Keith, M.(eds) 2006. A checklist of South African plants . Southern African Botanical Diversity Network Report No. 41. SABONET, Pretoria. Mustart, P., Cowling, R. & Albertyn, J. 1997. South African Wild Flower Guide 8. National Book Printers, Goodwood. Van Wyk. B. & Van Wyk. P. 1997. Field Guide to Trees of Southern Africa . Struik, Cape Town. Von Breitenbach, F. 1974. Southern Cape Forest and Trees . Government Printer, Pretoria.